A lot has happened since my last post. I’ve collected many swarms, and done a few cutouts. Some were fun. Some were no fun at all. I got a call for a swarm in Pottsville, and the newspaper showed up to cover all the excitement. Read the article here. Two days later, Pottsville called again. About 3 blocks from the previous swarm, at a cemetery, in a tree, about 25 feet up. This one was very challenging, because I was high up in a bucket-truck and it was very windy. And it was raining. Well, the paper was there again waiting for me. Read the article here. I finally caught a swarm that I know is not from a beekeeper’s yard. Atleast not directly. I picked this baby up and noticed a booming colony in the tree overhead about 40 feet up. The queen was in a little clump of bees on the grass across the sidewalk from the cluster. I don’t think she could fly. The homeowner told me that the swarm was on the sidewalk at first, but they walked up into a small bush by the time I got there. It is still early for swarms around here (or so I’ve been told). I left a bait hive at the location just in case another swarm decides to leave. I can’t wait to measure the brood cell size. Another bait hive of mine has a couple dozen scouts checking it out. It’s getting pretty exciting over here in PA. I told myself I’d never go to another generic (local) bee club meeting again. 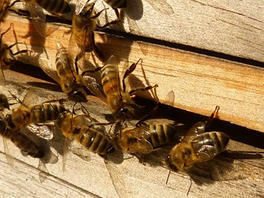 But I was suffering from spring/bee fever so I decided to attend a meeting held by a new (to me) bee club. The topic was “Spring Preparation”. It started out harmless enough with people making motions and seconding them, saying “aye” and all that fun stuff. Then, a first year beekeeper told everyone about a colony that he checked on a recent warm day only to discover that it was dead. He explained that it was very strong up until Christmas. The president of the club asked if he treated for mites (because of course, if he didn’t, that explains it). Well, in fact he did treat it. Not because he had mites or any other problem. The reason? “Because I already bought the treatments, so I figured I had better use them up.” I wondered if the bees were actually dead in the first place. I poked my finger up hesitantly and when given the nod asked what he did with his “dead” colony. “I cleaned all the bees out and stored the hive in my garage.” I asked if anyone had seen the video going around of bees coming out of “torpor” while a very experienced beekeeper is cleaning out an apparently dead hive. Silence. I briefly explained that bees can seem dead and remain that way for a few days, even when it is warm, and this condition is known as torpor. Shoulder shrugs all around. One member finally chimed in, “Well, you have to put those frames away in an unheated garage to protect them from the wax moths. That’s what it says in the book.” The book? Wax moths? It’s February. And we’re in Pennsylvania. Were wax moths going to move in to an ice cold hive now? So with that settled, it was on to spring preparation. What was the first suggestion? “Get those (Mite-Away Quick) strips in there!” Just get them in there. Treat early and often. Don’t check to see if any of your colonies are dealing with mites and not dying. Don’t acquire queens from genetic stock with hygienic traits. Just treat your one or two hives as if you were a commercial honey producer who depends on every single colony to produce as much honey as possible at any cost. Yeah, I wasn’t having fun. They referred to colonies that made it through winter (treated, wrapped, and loaded with syrup and fondant) as “survivors”. Those are the ones you split because they are survivors. My first thought was “How would one go about splitting a colony that didn’t survive.” But more importantly, is a colony that you babied and treated and fed all season really a survivor? I don’t think so. Hey, if you’re so emotionally attached to every single colony that you can’t bear to see one die for the betterment of the gene pool, then treat away. But don’t call them “survivors”. Survivors deal with mites without treatments, build up at the right time, and don’t require constant feeding to store enough for winter. You know, the way they’ve done it for millions of years. The rest of the meeting was spent talking about how many packages everyone was getting from the “old -timer” of the group, a commercial treater selling treatment-dependent bees that will eventually flood the area with weak, non-adapted genetics by way of drones. There was no discussion of swarm traps or catching (possible) feral swarms which is what I’m most excited about. Then the “newbies” were paired up with “qualified” mentors (who will most likely familiarize them with the treatment treadmill) and the meeting was adjourned. I didn’t get a chance to ask if anyone in the room didn’t treat their bees or didn’t plan to.. I doubt anyone would have raised their hand in this group. I’m going back next month just to ask and see what response I get. This should be fun. I’m obsessed with blue pollen now after seeing this post on BeverlyBees.com. I guess there are worse things to be obsessed with. And I’m not the only one. Rusty, at Honeybeesuite is too. So I planted 250 Siberian Squill bulbs in a long row about 50 yards away from my hives. I also ordered a quarter pound each of Borage and Lacy Phacelia seeds to spread around the many vacant lots and abandoned buildings in my area. These flowers also produce blue pollen as I learned at Honeybeesuite. The thing I’m wondering is: Do these plants also produce blue nectar, leading to blue honey? It will be interesting to find out. I don’t plan on harvesting a drum of blue honey from such a relatively small planting, but it would make for a nice picture if I could find some put away in some honeycomb. Author brucelovesbeesPosted on January 8, 2016 January 19, 2016 Tags blue pollen1 Comment on Blue pollen?